USA's Madison Chock, 16, and Greg Zuerlein, 20, perform to music from Minnie the Moocher and The Dancing Fool for their Original Dance at the 2009 World Junior Figure Skating Championships. Madison Chock and Greg Zuerlein made a clean sweep of the major junior titles this season, both in the United States and internationally, hauling in gold at every event in which they competed. After starting the season by winning their two Junior Grand Prixs in Italy and Great Britain, the couple won the SBS ISU Junior Grand Prix Final of Figure Skating in Goyang City, Korea in December. They followed up by winning the U.S. National Junior ice dance title in January and the ISU World Junior Figure Skating Championships in Sofia, Bulgaria in February. They won each phase of the competition at each event. Zuerlein started skating when he was four-years-old. 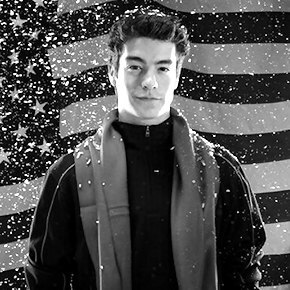 “My parents took me and my older sister, Brittany, to open skating,” he recalled, “and we both wanted to skate more so we went to Basic Skills class.” Brittany competed at the Junior Synchro Worlds with her team. His mother also skated on an adult synchro team. Now 16, Chock first went on the ice when she was five. “My parents liked to watch skating on TV,” she remembered. “I started watching and got interested in it with all the girls in the sparkly dresses and wanted to do it.” She competed up to intermediate ladies at Regionals, but never reached the national level in the ladies’ division. Chock first started ice dancing with Kurt Lingenfelter. They placed fourth in intermediate dance in 2006. Zuerlein first danced with Anastasia Olsen, winning the bronze medal in intermediate dance in 2005. The team placed 12th in novice dance in 2006. “She asked if I would like to skate with her, basically asking if we wanted to skate together, and I was all for it,” Zuerlein added. They placed fifth in novice dance at U.S. Nationals in 2007 and won the bronze medal in the junior division the following year. Igor Shpilband and Marina Zueva coach the couple, who train in Canton, Michigan. They usually train on ice for three to four hours a day, five days a week. Shpilband and Zueva also choreograph all of the couple’s dances. “We go over a lot of music choices with Igor,” Chock noted. “Then we choose what best suits us. We connect really well on the ice and we had done really well with West Side Story, so we thought we would try another love story.” “We like to have expressive music that builds a connection between us and the audience,” Zuerlein added. For an exhibition program, Chock and Zuerlein are using Aerosmith’s Come Together and Cryin. Both of the dancers plan to be skating coaches and both work now coaching Basic Skills classes. Chock also teaches some private skating lessons, while Zuerlein works at the concession stand at an ice rink. He works about 20 hours a week, while she works ten. Zuerlein is attending a community college, Schoolcraft College, taking 16 hours of classes. He plans to attend the University of Michigan in the fall studying business and information technology. Chock is a junior at Novi High School, where she is a member of the National Honor Society and was elected Student Council President in 2003. One of Chock’s off-ice interests is film making. She won the International Family Film Fest Award in 2003 for a screenplay that she wrote. Brandon Mroz, the 2009 U.S. silver medalist and the 2006 & 2007 Junior Grand Prix Final silver medalist, is credited with landing the first quadruple Lutz jump in a sanctioned competition at the 2011 Colorado Springs Invitational, and was subsequently ratified by the International Skating Union after video review. He landed it again in the short program at the 2011 NHK Trophy, becoming the first skater to land it in international competition.